1 A None No Power Seat 1 A is a standard Business Class seat which converts to a flat bed and is located at a bulkhead. The proximity to the galley and lavatory might be bothersome. 1 C None No Power Seat 1 C is a standard Business Class seat which converts to a flat bed and is located at a bulkhead. The proximity to the galley and lavatory might be bothersome. 1 D None No Power Seat 1 D is a standard Business Class seat which converts to a flat bed and is located at a bulkhead. The proximity to the galley and lavatory might be bothersome. 1 H None No Power Seat 1 H is a standard Business Class seat which converts to a flat bed and is located at a bulkhead. The proximity to the galley and lavatory might be bothersome. 1 J None No Power Seat 1 J is a standard Business Class seat which converts to a flat bed and is located at a bulkhead. The proximity to the galley and lavatory might be bothersome. 1 L None No Power Seat 1 L is a standard Business Class seat which converts to a flat bed and is located at a bulkhead. The proximity to the galley and lavatory might be bothersome. 15 A None No Power Seat 15 A is a standard Economy Class seat located at a bulkhead with additional legroom. This seat is available for selection at check-in as a Space+ seat for an additional fee. The tray table and the IFE monitor are located in the armrest making the armrest immovable, therefore, slightly reducing seat width. There is no floor storage available for use during take off and landing. 15 B None No Power Seat 15 B is a standard Economy Class seat located at a bulkhead with additional legroom. This seat is available for selection at check-in as a Space+ seat for an additional fee. The tray table and the IFE monitor are located in the armrest making the armrest immovable, therefore, slightly reducing seat width. There is no floor storage available for use during take off and landing. 15 C None No Power Seat 15 C is a standard Economy Class seat located at a bulkhead with additional legroom. This seat is available for selection at check-in as a Space+ seat for an additional fee. The tray table and the IFE monitor are located in the armrest making the armrest immovable, therefore, slightly reducing seat width. There is no floor storage available for use during take off and landing. 15 D None No Power Seat 15 D is a standard Economy Class seat located at a bulkhead with additional legroom. This seat is available for selection at check-in as a Space+ seat for an additional fee. The tray table and the IFE monitor are located in the armrest making the armrest immovable, therefore, slightly reducing seat width. There is no floor storage available for use during take off and landing. 15 F None No Power Seat 15 F is a standard Economy Class seat located at a bulkhead with additional legroom. This seat is available for selection at check-in as a Space+ seat for an additional fee. The tray table and the IFE monitor are located in the armrest making the armrest immovable, therefore, slightly reducing seat width. There is no floor storage available for use during take off and landing. 15 H None No Power Seat 15 H is a standard Economy Class seat located at a bulkhead with additional legroom. This seat is available for selection at check-in as a Space+ seat for an additional fee. The tray table and the IFE monitor are located in the armrest making the armrest immovable, therefore, slightly reducing seat width. There is no floor storage available for use during take off and landing. 15 J None No Power Seat 15 J is a standard Economy Class seat located at a bulkhead with additional legroom. This seat is available for selection at check-in as a Space+ seat for an additional fee. The tray table and the IFE monitor are located in the armrest making the armrest immovable, therefore, slightly reducing seat width. There is no floor storage available for use during take off and landing. 15 K None No Power Seat 15 K is a standard Economy Class seat located at a bulkhead with additional legroom. This seat is available for selection at check-in as a Space+ seat for an additional fee. The tray table and the IFE monitor are located in the armrest making the armrest immovable, therefore, slightly reducing seat width. There is no floor storage available for use during take off and landing. 15 L None No Power Seat 15 L is a standard Economy Class seat located at a bulkhead with additional legroom. This seat is available for selection at check-in as a Space+ seat for an additional fee. The tray table and the IFE monitor are located in the armrest making the armrest immovable, therefore, slightly reducing seat width. There is no floor storage available for use during take off and landing. 2 A None No Power Seat 2 A is a standard Business Class seat which converts to a flat bed. 2 C None No Power Seat 2 C is a standard Business Class seat which converts to a flat bed. 2 D None No Power Seat 2 D is a standard Business Class seat which converts to a flat bed. 2 H None No Power Seat 2 H is a standard Business Class seat which converts to a flat bed. 2 J None No Power Seat 2 J is a standard Business Class seat which converts to a flat bed. 2 L None No Power Seat 2 L is a standard Business Class seat which converts to a flat bed. 3 A None No Power Seat 3 A is a standard Business Class seat which converts to a flat bed. 3 C None No Power Seat 3 C is a standard Business Class seat which converts to a flat bed. 3 D None No Power Seat 3 D is a standard Business Class seat which converts to a flat bed. 3 H None No Power Seat 3 H is a standard Business Class seat which converts to a flat bed. 3 J None No Power Seat 3 J is a standard Business Class seat which converts to a flat bed. 3 L None No Power Seat 3 L is a standard Business Class seat which converts to a flat bed. 33 C None No Power Seat 33 C is a standard Economy Class seat. Proximity to the lavatory area might be bothersome. 33 D None No Power Seat 33 D is a standard Economy Class seat. Proximity to the lavatory area might be bothersome. 33 H None No Power Seat 33 H is a standard Economy Class seat. Proximity to the lavatory area might be bothersome. 33 J None No Power Seat 33 J is a standard Economy Class seat in the last row of this section of the aircraft. Recline might be limited. Proximity to the lavatory area might be bothersome. This seat might be bumped from crew, carts, and passengers passing from behind. 33 K None No Power Seat 33 K is a standard Economy Class seat in the last row of this section of the aircraft. Recline might be limited. Proximity to the lavatory area might be bothersome. 33 L None No Power Seat 33 L is a standard Economy Class seat in the last row of this section of the aircraft. Recline might be limited. Proximity to the lavatory area might be bothersome. 34 A None No Power Seat 34 A is a standard Economy Class seat in the last row of this section of the aircraft. Recline might be limited. Proximity to the lavatory area might be bothersome. 34 B None No Power Seat 34 B is a standard Economy Class seat in the last row of this section of the aircraft. Recline might be limited. Proximity to the lavatory area might be bothersome. 34 C None No Power Seat 34 C is a standard Economy Class seat in the last row of this section of the aircraft. Recline might be limited. Proximity to the lavatory area might be bothersome. This seat might be bumped from crew, carts, and passengers passing from behind. 34 D None No Power Seat 34 D is a standard Economy Class seat in the last row of this section of the aircraft. Recline might be limited. Proximity to the lavatory area might be bothersome. 34 F None No Power Seat 34 F is a standard Economy Class seat in the last row of this section of the aircraft. Recline might be limited. Proximity to the lavatory area might be bothersome. 34 H None No Power Seat 34 H is a standard Economy Class seat in the last row of this section of the aircraft. Recline might be limited. Proximity to the lavatory area might be bothersome. 35 D None No Power Seat 35 D is a standard Economy Class seat located at a bulkhead. This seat is available for selection as a Space + seat at check-in for an additional fee. The tray table and the IFE monitor are located in the armrest making the armrest immovable, therefore, slightly reducing seat width. Legroom might be limited due to the bulkhead wall. There is no floor storage available for use during take off and landing. The proximity to the lavatory area might be bothersome. 35 F None No Power Seat 35 F is a standard Economy Class seat located at a bulkhead. This seat is available for selection as a Space + seat at check-in for an additional fee. The tray table and the IFE monitor are located in the armrest making the armrest immovable, therefore, slightly reducing seat width. Legroom might be limited due to the bulkhead wall. There is no floor storage available for use during take off and landing. The proximity to the lavatory area might be bothersome. 35 H None No Power Seat 35 H is a standard Economy Class seat located at a bulkhead. This seat is available for selection as a Space + seat at check-in for an additional fee. The tray table and the IFE monitor are located in the armrest making the armrest immovable, therefore, slightly reducing seat width. Legroom might be limited due to the bulkhead wall. There is no floor storage available for use during take off and landing. The proximity to the lavatory area might be bothersome. 36 A None No Power Seat 36 A is a standard Economy Class seat located at in an Exit Row with additional legroom. This seat is available as a Space + seat for selection at check-in for an additional fee. The tray table and the IFE monitor are located in the armrest making the armrest immovable, therefore, slightly reducing seat width. There is no floor storage available for use during take off and landing. The proximity to the lavatory area might be bothersome. 36 B None No Power Seat 36 B is a standard Economy Class seat located at in an Exit Row with additional legroom. This seat is available as a Space + seat for selection at check-in for an additional fee. The tray table and the IFE monitor are located in the armrest making the armrest immovable, therefore, slightly reducing seat width. There is no floor storage available for use during take off and landing. The proximity to the lavatory area might be bothersome. 36 C None No Power Seat 36 C is a standard Economy Class seat located at in an Exit Row with additional legroom. This seat is available as a Space + seat for selection at check-in for an additional fee. The tray table and the IFE monitor are located in the armrest making the armrest immovable, therefore, slightly reducing seat width. There is no floor storage available for use during take off and landing. The proximity to the lavatory area might be bothersome. 36 J None No Power Seat 36 J is a standard Economy Class seat located at in an Exit Row with additional legroom. This seat is available as a Space + seat for selection at check-in for an additional fee. The tray table and the IFE monitor are located in the armrest making the armrest immovable, therefore, slightly reducing seat width. There is no floor storage available for use during take off and landing. The proximity to the lavatory area might be bothersome. 36 K None No Power Seat 36 K is a standard Economy Class seat located at in an Exit Row with additional legroom. This seat is available as a Space + seat for selection at check-in for an additional fee. The tray table and the IFE monitor are located in the armrest making the armrest immovable, therefore, slightly reducing seat width. There is no floor storage available for use during take off and landing. The proximity to the lavatory area might be bothersome. 36 L None No Power Seat 36 L is a standard Economy Class seat located at in an Exit Row with additional legroom. This seat is available as a Space + seat for selection at check-in for an additional fee. The tray table and the IFE monitor are located in the armrest making the armrest immovable, therefore, slightly reducing seat width. There is no floor storage available for use during take off and landing. The proximity to the lavatory area might be bothersome. 4 A None No Power Seat 4 A is a standard Business Class seat which converts to a flat bed. 4 C None No Power Seat 4 C is a standard Business Class seat which converts to a flat bed. 4 D None No Power Seat 4 D is a standard Business Class seat which converts to a flat bed. 4 H None No Power Seat 4 H is a standard Business Class seat which converts to a flat bed. 4 J None No Power Seat 4 J is a standard Business Class seat which converts to a flat bed. 4 L None No Power Seat 4 L is a standard Business Class seat which converts to a flat bed. 5 A None No Power Seat 5 A is a standard Business Class seat which converts to a flat bed. 5 C None No Power Seat 5 C is a standard Business Class seat which converts to a flat bed. 5 D None No Power Seat 5 D is a standard Business Class seat which converts to a flat bed. 5 H None No Power Seat 5 H is a standard Business Class seat which converts to a flat bed. 5 J None No Power Seat 5 J is a standard Business Class seat which converts to a flat bed. 5 L None No Power Seat 5 L is a standard Business Class seat which converts to a flat bed. 50 A None No Power Seat 50 A is a standard Economy Class seat in the last row of the aircraft. Recline might be limited. The proximity to the galley and lavatory might be bothersome. 50 B None No Power Seat 50 B is a standard Economy Class seat in the last row of the aircraft. Recline might be limited. The proximity to the galley and lavatory might be bothersome. 50 C None No Power Seat 50 C is a standard Economy Class seat in the last row of the aircraft. Recline might be limited. The proximity to the galley and lavatory might be bothersome. 50 D None No Power Seat 50 D is a standard Economy Class seat. The proximity to the galley and lavatory might be bothersome. 50 H None No Power Seat 50 H is a standard Economy Class seat. The proximity to the galley might be bothersome. 50 J None No Power Seat 50 J is a standard Economy Class seat in the last row of the aircraft. Recline might be limited. The proximity to the galley might be bothersome. 50 K None No Power Seat 50 K is a standard Economy Class seat in the last row of the aircraft. Recline might be limited. The proximity to the galley might be bothersome. 50 L None No Power Seat 50 L is a standard Economy Class seat in the last row of the aircraft. Recline might be limited. The proximity to the galley might be bothersome. 51 D None No Power Seat 51 D is a standard Economy Class seat in the last row of the aircraft. Recline might be limited. The proximity to the galley and lavatory might be bothersome. 51 F None No Power Seat 51 F is a standard Economy Class seat in the last row of the aircraft. Recline might be limited. The proximity to the galley and lavatory might be bothersome. 51 H None No Power Seat 51 H is a standard Economy Class seat in the last row of the aircraft. Recline might be limited. The proximity to the galley and lavatory might be bothersome. LATAM Airlines' onboard entertainment system aboard their A350-900 aircraft provides access to a wide variety of music. Additional information may be viewed by clicking here. LATAM Airlines' onboard entertainment system aboard their A350-900 aircrafts provides access to a library of over 100 films, complete seasons of five TV series, special programs for children, and several games. Additional information may be viewed by clicking here. AC power ports and USB ports are located at every seat in Premium Business Class. 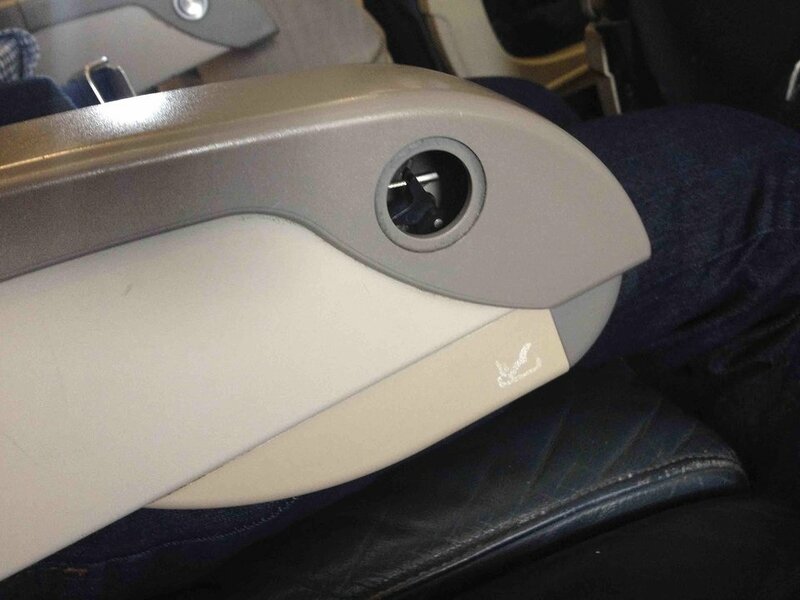 In Economy Class AC power ports are located between the seats (two per each section of three seats) and USB ports are located at each seat at the bottom of the seat back IFE monitor. Full service meals and an assortment of beverages are served on board LATAM Airlines' Airbus A350-900 aircraft serving long-haul flights. LATAM Airlines' newest aircraft in their fleet is the Airbus A350-900. The Airbus A350-900 is one of the most technologically advanced commercial aircraft. The aircraft is made of carbon-fibre reinforced plastic which supports lower fuel burn. The aircraft cabin was designed to be wider across to offer passengers a roomier and comfortable experience via greater seat width. LATAM Airlines A350-900 aircraft feature Premium Business and Economy Class cabins. Economy Class also features Economy Space+ seating that offers additional legroom for a fee. LATAM Airlines Airbus A350-900 aircraft fly long-haul routes from South America to North America and Europe. Foot restriction due to energy box for plugs. Feet support does not goes all the way to the end like in the other seats. Good acft with good seat and windown view too. The noise, on this seat, isn't loud. LATAM Brasil flies 1 versions of Airbus A350-900.